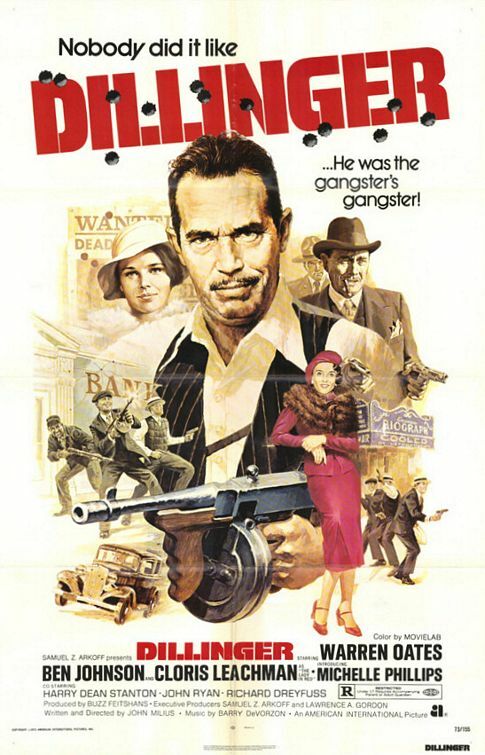 For all those who enjoyed Michael Mann’s PUBLIC ENEMIES, and even those who didn’t, here’s a somewhat lesser-known treat: John Milius’s DILLINGER, from 1973, starring Warren Oates as bankrobber John Dillinger and Ben Johnson as lawman Melvin Purvis. As Michael Mann’s newer Dillinger movie illustrates, a cops-and-robbers flick is always at its best when it’s about two equal but opposing forces. Milius’s movie has two incredible character actors centering his Dillinger film. Warren Oates is best known to younger generatiosn as Sgt. Hulka from STRIPES, but in the decades before that, he built up a stunning career of dirty, often ugly character actor performances. He’s sure not the prettier Dillinger that Johnny Depp created, but equally compelling. Like Mann’s movie thirty (!) years later, the earlier DILLINGER film is full of still-recognizable supporting actors, such as singer Michelle Phillips as Dillinger’s girlfriend Billie Frechette, Harry Dean Stanton as Homer Van Meter, Clint Eastwood regular (and Juliette’s dad) Geoffrey Lewis as Pete Pierpont, and Cloris Leachman as Anna Sage, the low-down whore who sells Dillinger out. Oh, and a very young Richard Dreyfuss as Baby Face Nelson. You haven’t really enjoyed a manly gangster picture until you’ve enjoyed the spectacle of Warren Oates smacking around Richard Dreyfuss. As that aforementioned pleasure implies, this is definitely more of a guy’s guy movie; whereas PUBLIC ENEMIES was constructed much more as a romantic story. But for fans of guy’s guy movies, DILLINGER is almost a necessity, and anyone at all who enjoyed PUBLIC ENEMIES will find the similarities and contrasts to be compelling. DILLINGER is tough to find on DVD and rarely screens anywhere, but Netflix occasionally has it. Sometimes it’s available, sometimes it’s not. (Netflix and DILLINGER apparently have a stormy relationship.) Well worth the effort. This piece was originally written and posted on July 7th, 2009. I stand by my recommendation. Movies I Wasn’t So Nice About: LEGION (2010). From The Archives: DESPICABLE ME (2010).